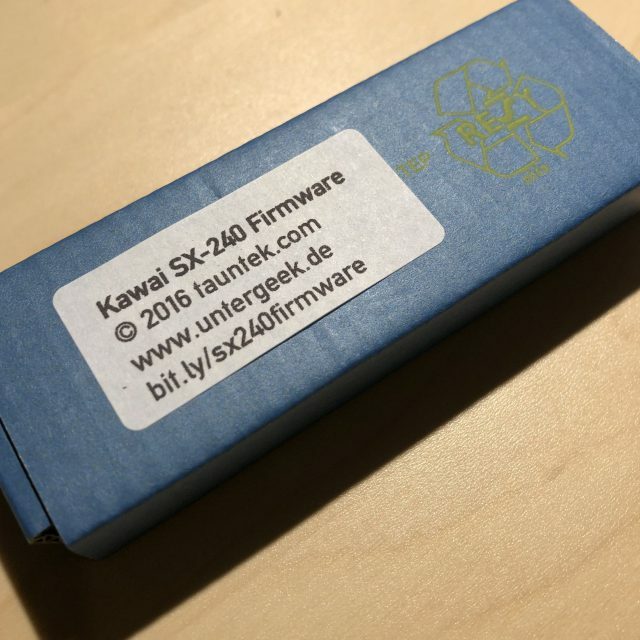 21st-century overhaul/rewrite for the classic but rare Kawai SX-240 which makes it possible to control the parameters with any MIDI faderbox. Written by Bob Grieb of tauntek.com. More information by the author of the firmware here. Note: The code is also available for download via Bob’s page, so you could burn it yourself. When you are buying the firmware chip here, the firmware author gets a share – meaning that you are supporting the work of a brilliant engineer with a true love for vintage synth gear. Two-chip chipset to upgrade a Kawai SX-240 with additional functions like CC control and bug fixes; engineered by Bob Grieb (tauntek.com). License fee to author included. The chipset includes two 27C256 programmed chips to exchange for the "Master" and "Slave" ROM used in the factory SX-240. The price includes a license fee for the software to the author, Bob Grieb (tauntek.com). Deliveries to non-EU destinations may cause additional local taxes and customs charges. You may return the chips within 14 days after receiving them for a full refund; please bear the return shipping costs.